Several years ago there was a problem with a valve or gasket (I forget which) in our Nissan Altima. My dad took the car to his long time friend, Mohammed the Mechanic, who said he fixed a similar problem earlier this week on an Accord. Our mechanic said it’d probably take a few hours and he’d have the car back to us by the end of the day. He and my dad agreed upon a price — with the understanding that, since he hadn’t done this exact thing on an Altima, it might take longer. He also sold used cars and insisted that we take the best car off his lot — a Lexus, rather than have my mom come pick us up. Later that day we get a call from him, expecting our car to be ready. It’s not. Turns out our Nissan requires significantly more labor which may have included even pulling the engine. Not wanting to keep his loaner for too long (what if someone wanted to buy it?) we try to bring it back but he refuses. A day or two later, when it is finished my dad points out that it simply isn’t fair to charge the initial price because the labor far exceeded what was expected. He knew that the estimate was just an estimate. Mohammed refused to take any more money. This was not a one time occurrence, either. A lot of his business was selling reconstruction titled cars. He’d buy two (or three) crashed cars and piece them together. Everyone I knew who purchased a car from him got a long lecture on what a reconstructed title was and how it would be harder for them to resell. 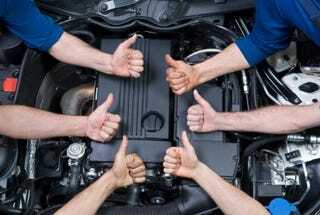 He also stressed that he couldn’t give warranties and would share the story about the customer who had a car of his only last a few months before the transmission failed. He genuinely cared that his customers were comfortable.